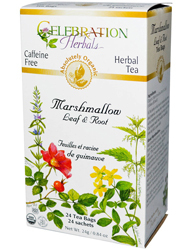 Organic Marshmallow Leaf & Root Tea, by Organic Connections, has been called the “aloe vera for internal organs.” It helps promote urinary tract health. Marshmallow root and leaf (Althaea officinalis) has been used for centuries. It was advocated by Hippocrates for its virtues. Native to Europe, marshmallow grows in wet soils. Its leaves are harvested in August and the roots are harvested in the autumn. This light green tea has a very agreeable, mellow taste. All the herbs in this tea are organically grown and prepared, ensuring their natural taste and active properties are enjoyed in every cup of tea. The manufacturer's organic audit trail enables traceability from the field to your cupboard. Suggested Usage: Take ½-2 cups per day. Use one tea bag per cup of boiling water, cover and steep for 7-12 minutes. This is known as the infusion method.